Include on the list of the Dodge Journey is brake assist. Brake assist is designed to ensure that the SUV's brakes have appropriate power in the event of an emergency situation. This ensures safe braking in such a situation. 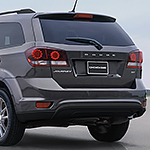 The Dodge Journey also includes four-wheel disc anti-lock brakes as well as electronic brake force distribution. The safety features on the Dodge Journey also include crumple zones. The strategically integrated crumple zones are designed to absorb energy at the time of an impact, directing it away from passengers. In addition, the Dodge Journey features seen high-tech airbags.